The luck of the Irish is all well and good, but the Magic Charms slot machine from Microgaming incorporates this theme in a brand new way. Here, you'll find the Pots of Gold at the end of rainbows mixed in with luxurious items like diamond Rings. 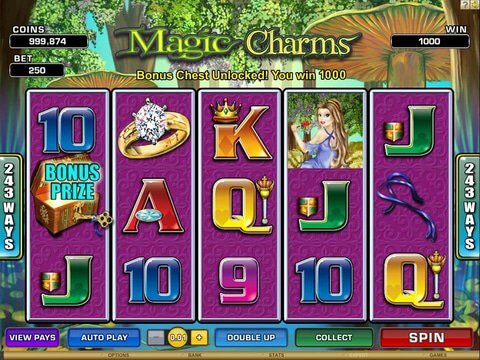 If you're curious, you can review it right here with the Magic Charms free play slot demo that we have made available to Canadian gamblers with no download and no registration required. If you like what you see, you can even enjoy it on the go with your favorite mobile device. There are five reels and 243 ways to win, and you'll be able to bet anything from a quarter up to $50 on this particular game. Of course, this is a small range compared to many Microgaming titles, so those interested in penny slots or even high rollers may be happier elsewhere. The features are nice, and they start out with three different wilds that can double wins or even trigger bonus rounds if they land just right. There are up to three free spins to win, and while this doesn't seem like much, the winnings that you can accrue as the feature plays out are quite nice. There are instant prizes found in Treasure Chests, too, so be sure to keep your eyes open for these as you go. Finally, you can double or quadruple anything you win with the optional Gamble feature, but be sure to use it with discretion as you can also lose the previous spin's winnings. Another title with an amazing luxury theme is Mega Fortune from Net Entertainment. Spread across five reels and 25 paylines, this one is about living large in the big city. There's a potential jackpot of $20,000, and features like wilds and prize wheels can help you rack up the winnings. There's even a progressive jackpot that's paid out more than $200,000 to lucky winners!